Are You Ready For The Online Dating FULL MOON This Sunday? The holidays are now over. And if you found yourself single during the holidays or after new years; if you didn’t get that midnight kiss from that special someone for one reason or another, then don’t sweat it. There is hope. Things might just turn around for you this Sunday, Jan. 7. The thing is: Most online dating sites have in the past experienced a surge in dating after the holidays. And the first Sunday of the new year has proven to be the busiest day in online dating history. People have even dubbed it “Dating Sunday” Some are even calling it the "Full Moon" of the online dating world. So the 7th of January is expected to be one busy day for the online dating sites, with most major sites expecting record high surges in online activity. In the previous years, during this online "full moon",­­ there is usually a rise in new user registrations. It can even go as high as 42%. It’s a full moon in the dating world that’s for sure! And just like werewolves, singles are usually ready to pounce on the next pretty prey. And with valentine’s day just over a month away, who can argue with these stats? The easiest way to snag that potential valentines hook up or hopefully find long-term love is to be online this Sunday. This is the time to put yourself out there. 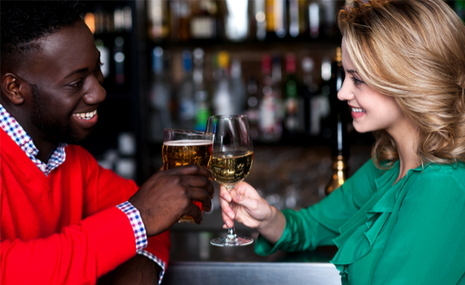 Love or lust, “Dating Sunday” is your best bet. So get freaking geared for this great day. Put yourself out there. Take control of your online dating experience. Don’t wait for the other “werewolves” to chat you up. Make that first move! Playing hard to get or being shy won't give you that well-deserved mileage over the others. Flirt all you want. Talk to as many people as you can. Just get busy. The greatest tip for this Sunday is: If you really want to make great use of this Sunday Surge, then you better UPGRADE YOUR MEMBERSHIP and enjoy all the features that these dating sites offer...like starting new conversations! Now, go dress up, put on some nice clothes for that captivating FRESH profile photo! Or upload the one you took over the holidays while on vacation. It’s a new year. Showcase the new you. The full moon is real. It's your time to shine and let some hungry singles pounce on you!!! 5 responses to "Are You Ready For The Online Dating FULL MOON This Sunday?"